I originally hoped to get something down earlier but the week between Texas and Florida was a bit full for certain obvious reasons. Basically, Week 17 was part of a three week trip for games in Texas and Florida, as well as a Christmas spent in Fort Lauderdale with my girlfriend’s family. It also gave me the chance to clinch a few more states in my quest to visit every county in the country. However, this write-up is to summarize the Texas portion of the trip. Starting out on Monday, we took a rather indirect route to Arlington. Starting west on I-80 through Ohio and Indiana into Chicago. From there it was following the I-88 Tollway and I-39 north to Rockford, Illinois. Then it was US20 west into Iowa and also past the homestead of Ulysses S. Grant in northwest Illinois. After spending the first night in Dubuque, Iowa, it was a quick stop at the Field of Dreams movie sight in rural Dyersville, Iowa. If you’ve seen the film and enjoyed it, it’s quite cool to see the movie site. Truly, if you build it, they will come. After that, it was trip northwest and through New Hampton, Forest City, Algona, Spirit Lake, Spencer, Cherokee and south to Avoca for the second night. That day I was able to mark Iowa as completed. The next day, it was west on I-80 and south on I-29 and into Nebraska City, Nebraska. US75 took us south through Tokepa, Kansas and onto the Kansas Turnpike. Which is a rather depressing highway devoid of anything scenic. Not even rolling farmland in this part of the state. I-35 continued through Oklahoma City with some touring around the state capital and to purchase some really cheap gas (for the time) at $1.829 on the city’s south side. The rest of the way Wednesday was a night drive to Arlington, Texas. Luckily, hotels near the stadium aren’t that expensive. Now, the University Interscholastic League (UIL) administers the sports of the public schools of Texas, as well as a handful of very large private schools. The rest of the state participates in other associations for private, parochial, or home school teams. For the past few years, the championship games have been played at AT&T Stadium (formerly Cowboys Stadium). It started with the 5A championships (two games) at San Antonio’s Alamodome. The rest of the state would play a state championship game wherever it was most beneficial for the two competing teams. Soon, the 3A, 4A, and 5A games were moved to Cowboys Stadium and 1A and 2A were played at Mansfield just south of the DFW area. The 1A 6-Man games were played in Abilene’s Shotwell Stadium. 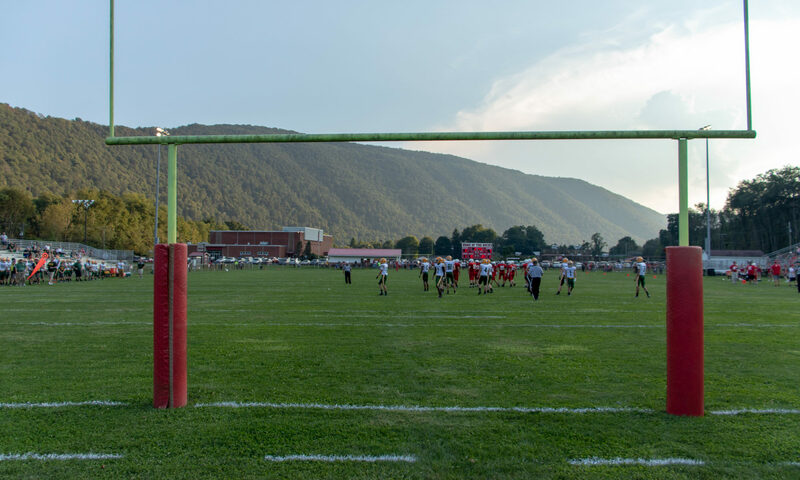 At the time, the 3A Division I game was played a week earlier than the rest of the 11-man field. The next year, all ten 11-man championships were played at Cowboys Stadium. Again, the 3A Division I game was played a week earlier so 9 games were held during the final week over three days. Last year, two changes were made. The 6-man games were moved to AT&T Stadium and the 3A Division I playoffs were expanded to also play their championship the same weekend as the rest of the state’s 11-man field. This made for ten games played over 3 days. Four games on Thursday, three games on Friday, and three games on Saturday. Thursday games started at 10am and then at 1pm, 5pm, and 8pm. While the Friday and Saturday games were scheduled for 12pm, 4pm, and 8pm. Due to time constraints, the Thursday games ran quite long and didn’t finish until midnight. One thing that AT&T Stadium does is that they open sections as they need them. To start Thursday, only the mezzanine sidelines and lower level sidelines are open. For those that’ve never been there, once you enter through one of the endzones, you’re at massive plazas on the second level. The lower level is sunken into the ground. As attendance progresses, the second level endzone opens and then the lower endzones. After that, it’s the club level sidelines and then club level corners. After that, it’s the upper level that opens, which includes the upper level endzone seats. This can make seating unbeable for games that SHOULD have more seats, but wait until they really are forced to. For this year, the club level wasn’t opened until a few minutes into the first game on Saturday. The lower levels were packed with only a plethora of single seats available. As I’ve learned in the past, I waited for the club level to open early and get good seats. Once again, I sat front row in the club level for all three Saturday games at about the 20-yard line. 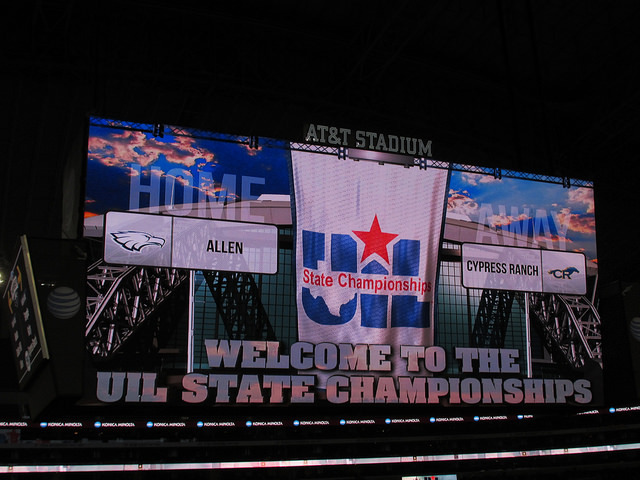 My only complaint was the side I was on was the Katy-Cypress Ranch side. Which meant the one team I really liked (who was playing that day) was Cedar Hill in the third straight matchup with the Katy Tigers, and I was on the ‘bad side’. But, for the game setup, the tickets are reasonable. Prices at the door are $15 per day and though they explicitly state on the tickets that there’s no reentry, if you ask, they will scan your ticket and let you leave and reenter. There’s a Walmart across the street (which I still find quite odd) that has a McDonalds which makes for a much cheaper meal than paying for the stadium food. In addition to the $15 tickets, the parking each day on the stadium lots is $10. The program is $5 and isn’t as extensive as I’d like. Primarily, the team pages for those playing don’t show previous championship history sufficiently. Though they at least print a year-by-year results list for both the UIL and the PVIL. So, all tolled, the cost for two people to attend all 10 games was $120 not including the program. Which equals to $6/game per person. Which isn’t a bad price at all for what you get to see. And, as I’ve said in the past, Ohio and Pennsylvania can’t even lick the boots of Texas when it comes to their championship game environments. Teams vary and in any year I can point out with some confidence which Ohio teams could beat which Texas teams. But, what I once considered ‘close’ isn’t so much. Namely because at the highest level, Allen under Kyler Murray has been an absolute beast that no Ohio team could touch. However, back to the games themselves. The games are scheduled in ascending order by classification. Then, it’s by division. Each year, they alternate whether Division I or Division II goes first. For instance, 2A Division I is a bigger division than 2A Division II, and therefore, goes second. Last year, Division I went first. Now, Texas’ classification setup is a bit different and has changed recently. Formerly, there was 5A, 4A, 3A, 2A, 1A and 6-man. At some point, 5A was split into 5A Division I and 5A Division II. Then 4A split, and then 3A and 2A split. This left 1A and 6-man with only one championship each. This led them to be named 1A 11-Man and 1A 6-Man. This gave 10 total championship games. The divisions aren’t known until the playoffs are determined. In the beginning of the split, the top three teams in each district made the playoffs. The largest school (regardless of finish) in those three teams got placed into the Division I playoffs in that classification. The remaining two teams were placed into Division II. This made Division I finish a week earlier than Division II (a holdover was 3A Division I which never expanded the playoffs until last year). A few years ago, 1A 11-Man and 1A 6-Man split to form 1A 11-Man Division I, 1A 11-Man Division II, 1A 6-Man Division I, and 1A 6-Man Division II. Bringing us to the current 12 championships. This year, 6-man was relabeled as 1A and the five 11-man classifications were relabeled as 2A through 6A. At 5A and 6A, the split is still done the same. Waiting until the playoffs to perform the split. In the lower levels, the split is done prior to the season and your district only includes teams in your class and division. So, how were the games? Amazing. And I mean that sincerely. This was, easily, the best weekend of football I had seen. Having missed the Ohio championships this year, I’ve read and watched some of the play. But, it doesn’t compare to what Texas put on. So, here’s the matchups, some notes, and info in order. Albany held a 21-7 lead heading into the fourth quarter in a tightly contested game. Bremond scored twice to tie it and then with 1:17 left scored on a 23-yard TD run to take the lead and hang on to win, 28-21. Only good thing about this game is I was hoping Canadian would win. I always enjoy cheering on west Texas or Panhandle teams and Canadian qualified easily for that, on US83 just west of the Oklahoma line. Last year, the team from the area was Wellington. After seeing the game in Memphis (TX) years ago, I enjoy cheering on the teams from that area of the state. This game, though, was one-sided for the last three quarters. After trailing 7-0 after one, Canadian just demolished them and turned it into a laugher. This was the second of the four ‘slow’ games. Waskom was appearing in their first championship, and won easily before giving up a late touchdown to make it look respectable. Attendance for this game was limited as Waskom was from far east Texas (literally bordered Louisiana off I-20) and Newton was along the border south near Houston. The last day of the game had some firepower, but Cameron Yoe was just too much. Mineola couldn’t keep up. Cameron Yoe tied the record for most points in an 11-man championship (and could’ve broken it but went very easy late in the game). The funny thing was the Mineola Yellowjackets wore orange and white jerseys. The reason behind this is lost on me. The first day alone had it’s good spots and seemed to be par for the course with the smaller schools. A great comeback, and a 110-point blitzkrieg. After returning for the second day, things picked up. West Orange-Stark (WOS for short on their helmets) were a team looking for their first title and were facing the Gilmer Buckeyes, a team that’s quite capable as they’ve appeared in a recent title game. WOS jumped out to a 25-7 halftime lead and were playing lights out on defense. Only one missed opportunity that Gilmer converted into an easy touchdown gave them the early score. Gilmer though, made all the right changes at halftime. The vaunted defense of WOS was stymied and WOS’s offense turned horrific. An interception led to a touchdown followed by a fumble recover for a touchdown and WOS’s lead was cut to 25-21 after three. The three missed conversions were starting to look like a big problem. A minute into the fourth, Gilmer scored to take the lead. The WOS offense just couldn’t turn it back on. Gilmer than stuffed them late with a short touchdown run to make it 35-25. The Navasota Rattlers are from a smallish city in east Texas that I’ve been to once in my life. They played in the championship two years ago, defeating Gilmer easily. The team is one that I really like in Texas and was glad to see them back in the championship. They’re one of my favorites. After being tied 14-14 through the first half, Navasota connected on an AMAZING one-handed touchdown catch to take the 21-14 lead. Seriously, look at the link below. It was short lived, however, as Argyle scored twice late in the third quarter to take the 28-21 lead. The second was after a fumble by Navasota that put them in a bind. However, late in the game, Navasota snagged an interception and turned it into a touchdown with 59 seconds left on a 1-yard run. After tying it at 28-28, the game advanced to overtime. In the first overtime, advanced from the 25 (Texas uses college rules) and scored on a 7-yard run to take the 35-28 lead. Navasota answered with a 4-yard pass and tied it. In the second overtime, Navasota went first and scored on their 5th play with a 13-yard touchdown pass. Argyle was stymied on three straight plays and faced a 4th and 5 at the 20. An odd run attempt was stopped short and Navasota won their second championship in three years. Ennis is from just south of Dallas while Cedar Park is from the Austin area. This was the second time I’ve seen Cedar Park play. They’re a newer school nicknamed the Timberwolves. Meanwhile, the Ennis Lions are a much older team wearing all maroon. Cedar Park led 21-17 at the half, and Ennis led 31-28 after the third. Cedar Park scored on a 21-yard touchdown pass on 4th & 18 to take the lead with 5 minutes to go. With less than two minutes to go, Cedar Park missed on a short field goal that hit the upright. Ennis made them pay as seconds later they connected on a 36-yard touchdown pass to take the lead for good, 38-35. All three games were great. Gilmer with the big comeback that was a ‘tale of two halves’. Navasota with the comeback late, the overtime, and the stop to win it. And Ennis and Cedar Park trading blows. Aledo is from the DFW area, while Temple is from just north of Waco along the I-35 corridor. Aledo brings a huge crowd, and it wasn’t surprising that such a crowd showed up. Luckily, I arrived 60 minutes early and managed to park easily in one of the extended lots. The crowd took quite a while to filter in as the roads were gridlocked at game time. This was partially because the parking lots weren’t planned properly and everyone tried one of two main ways into the lots. However, this game lived up to its predecessors. Aledo led 21-14 after 1, and 35-17 at the half. And then Temple made a run. With under two minutes to go in the third, Temple scored on a 9-yard run and then recovered a deep onside kick. Two plays later, they converted on a 5-yard pass to make it 35-31 going into the final quarter. ALedo scored quickly to extend the lead to 42-31. And then Temple went on a tear, scoring two minutes later to make it 42-38 and then successfully completed a 40-yard pass from the wide receiver to take the lead with 5:50 left in the game. This ranks up there with the other highlight. Unfortunately, I can’t find the best quality video. But, it’s a must-see. The downside, is Aledo scores again to take the lead and wins the game, 49-45.
https://www.youtube.com/watch?v=g5lg3bTr3eM (the best I could find, unfortunately). I still have to go through my camera to see if I have any of these plays myself. Cedar Hill is another one of my ‘favorites’ in Texas. Namely because I’ve seen them so many times. This was my fourth time seeing them. Though, it was also my fourth time seeing Katy. And this matchup was geared to be the best of day three. The third straight championship meeting between the Cedar Hill Longhorns and the Katy Tigers. There’s something about Katy that I didn’t like. Though, I wound up sitting on their side. I did not want to be on the Allen side for the nightcap, so we just stayed put. Cedar Hill opened with a safety and then Katy got a 53-yard touchdown run to end the first up 7-2. Two field goals in the second made it 13-2 at the half. Then Cedar Hill came alive. Two touchdowns in the third, including a 61-yard tiptoe pass down the sideline made it 17-13. Katy answered with a long kickoff return and then a three yard touchdown to reclaim the lead, 20-17. Early in the fourth, it was Cedar Hill’s turn for two straight field goals, as they connected on a 44- and 26-yd kicks. Then it was a matter of hanging on for the victory, 23-20 to win the rubber match of the three straight Katy-Cedar Hill championship games. This game was a corronation of Kyler Murray. The quarterback for the Allen Eagles the past three years, finished 42-0 as a starter with three straight championships. The only team to win three straight in the largest classification and division. Cypress Ranch was in their fifth year of existence and come from a massive suburban growth area of Cypress in the Cy-Fair ISD. They were no match for the Eagles. Though the game was one-sided, it did have it’s moment. Especially when Murray went in for one play late for his curtain call to a standing ovation from the Allen faithful. Texas A&M is going to have another great QB at the collegiate level. After the game, it was a short drive east for a hotel outside the Arlington area. With the Cowboys playing Sunday afternoon against Indianapolis, the room rates skyrocketed. This was my fourth straight year attending the UIL finals at AT&T Stadium (formerly Cowboys Stadium). It’s unreal to attend a championship game with 30-, 40-, or 50,000 fans. The stadium is a monument to football. For as big as it is, it doesn’t dwarf the game the way you see in other states. The first day was ‘slow’ and we left the stadium for cheaper food nearby. The next day, it was early lunch before the game and then dinner was nachos and hot dogs at the game. Followed by a trip to Whataburger after the game (second only to In-N-Out). Saturday, due to the expected crowds, once we aquired our front row club seats for the first game we maintained them through the day by alternating who left for food or restroom breaks. The last day was hot dogs and nachos again. Also, one thing that only seems to be sold here that I can find is “Chill” brand italian ice. A little pricy at $5.50 each, but they’re worth it. In all, it was a worthwhile trip up to this point. But it wasn’t over. Two more weeks lay ahead. Next was a quick drive to Boca Raton for the Tuesday night Boca Raton Bowl between Marshall and Northern Illinois. And then the first annual State Champions Bowl Series held at the same stadium the last Saturday of the year. My write up for those games and my final recap of the whole season should be up very soon. I’m moving again soon, and taking off some more time to get that accomplished. So, I should be able to find the time to write. As for photos and videos, they may be later this off-season. It just depends. As of the Texas games, my total for the year was 124 high school football games attended. My girlfriend had been to 111. But, there was three more high school games to go.